Our second of five pregnant does gave birth yesterday. 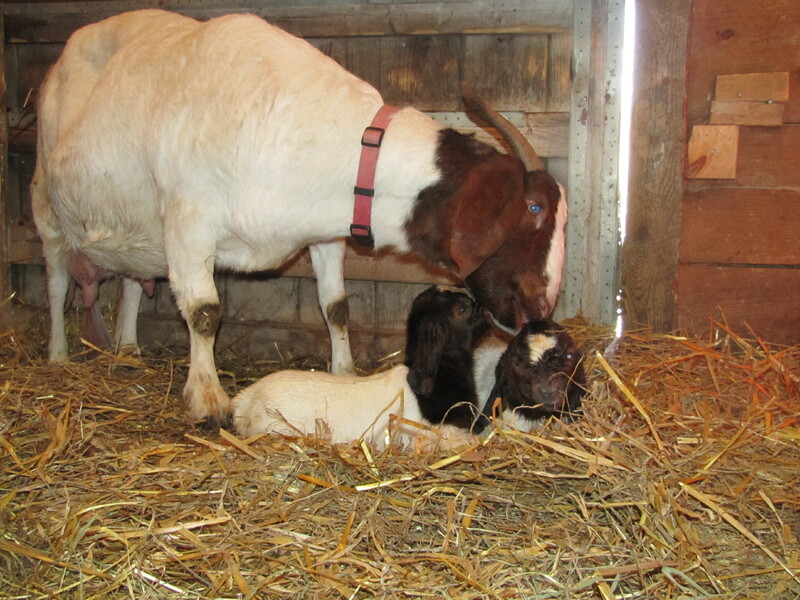 A traditional red-headed doeling followed by a similar buckling. This is a bit unusual as more often than not, bucklings are born first. Both were very-good sized, much bigger at birth than Jessie’s three surviving quadruplets. Ruby is our “loudmouth” doe, and the doeling takes after her. The human kids have decided to name her “Tweet,” after the T-37B trainer aircraft known as one of the loudest in the Air Force inventory (it was also known as the “6,000 dog whistle” and the “Converter” because it was the most efficient machine ever made for converting fuel into noise). Tweet’s brother has been named “Hercules,” after the C-130. Herc is a big boy, and once he dried off weighed 11 pounds and 12 ounces, more than a pound heavier than Tweet, who was on the heavy side for a doeling (10 lbs 6 ounces). We still have three girls left to kid, and the barn is getting full and loud!